Hi Beauties! I hope you’re good. Welcome back to my blog! 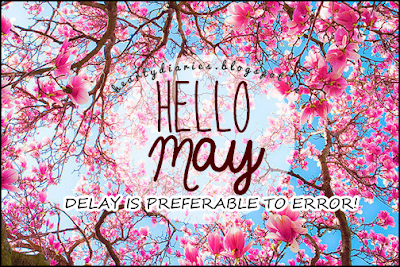 Moreover, welcome to MAY! I really love the starting of each month as I set new goals for myself, plan new things, get my salary (I am a MATHS teacher), get my braces adjusted along with many other excitations and new things. I don’t believe in setting goals for entire year as I am not a person who can manage it but I can atleast manage monthly goals. I really love my year planner as it has monthly quotes which motivate me a lot and help me plan the whole month and set my goals for the upcoming thirty days. GOALS GOALS GOALS? Haven’t I said that much? What can be another word instead GOALS but means the name? Aaah! I can’t recall it at the moment. Maybe I should look out for a synonym dictionary! Eh! I’m too lazy to do that. +1 this post if you’re lazy like me or even more than me.. Hahaha! DELAY IS PREFERABLE TO ERROR! This is something what my father has always taught me and my siblings and we have been believing and following this since our childhood. I really believe that delay is a dilemma. I am someone who would even work double than usual in 24 hours to avoid last moment haphazard. I believe in being on time always. All my friends really appreciate me for this as if we plan to meet at 4 o’clock, I always reach at 3:59 or even before but never at 4:01. You might be thinking that I just said I am lazy then how can I be not a delay person. I am really very lazy but when it comes to do what is meant to be done, I am always ready and punctual. The planner also says, “If you are not committed by yourself, then you won’t be capable of developing the similar commitment from others”. So true that is. I have friends who reach super duper late literally everywhere but when it comes to me, they’re always on time because I’m always on time. Because I keep my promises, people keep theirs with me. I highly believe in both of these quotes and follow them already but I have to follow it even more punctually than I have always done. As for my blog also, I have never missed a day which I committed to myself because of this quote. Delay is a termite that can ruin and hollow up your plans and opportunities. Also it’s May and it’s terribly hot in North India. Make sure to drink enough water and keep yourself healthy and hydrated. Please keep a bowl of water at your terrace for birds too as they’re precious, they’re beautiful and above all, they’re a living being like us. I hope you liked today’s post. Thank you so much for reading. Do let me know by commenting below if you agree with me. Do share your plans with me. I really plan to be more and more punctual in life ahead. May this month bring a lot of happiness, good news and success in your lives. Bye! Take care guys! Stay happy! Thanks and same to you! ????? ?